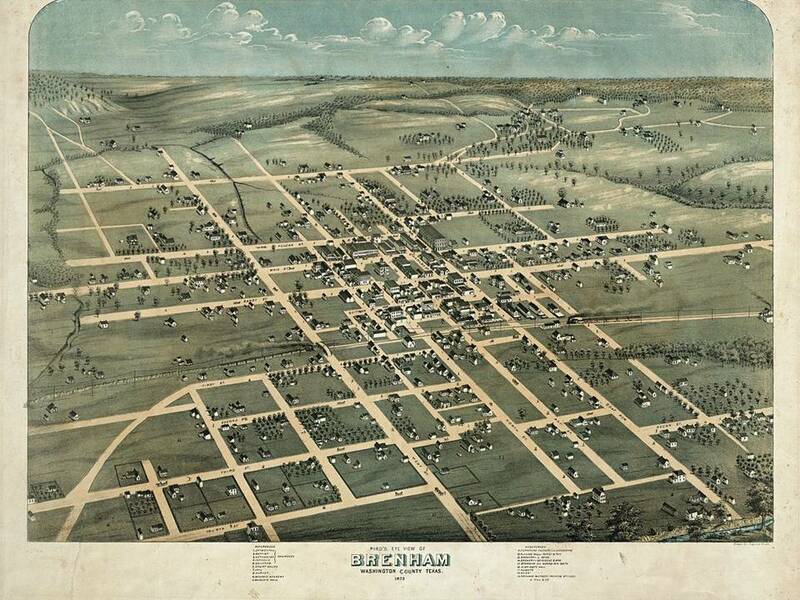 Brenham is a Texas town that has fascinated me since I first arrived in the Lone Star State in 2010. My wife and I stayed in a bed and breakfast inn in Brenham prior to moving to Texas and we were impressed with the historic charm of the town. 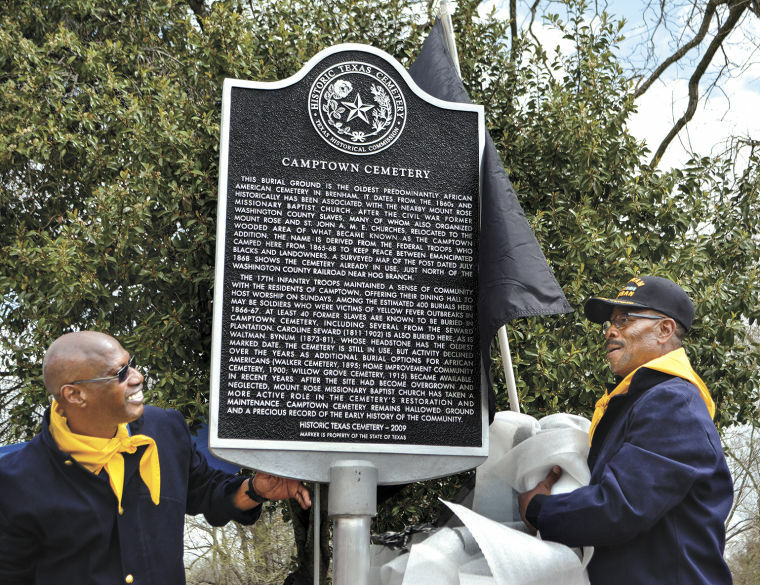 I was quite delighted to conduct genealogical research on the family of Robert S. Sloan who lived in Brenham and was buried in the Camptown cemetery there. Mr. Sloan continues to be a source of great fascination for me. Robert S. Sloan 1858-1916 seated with his wife, Mattie Knox Sloan born about 1861. 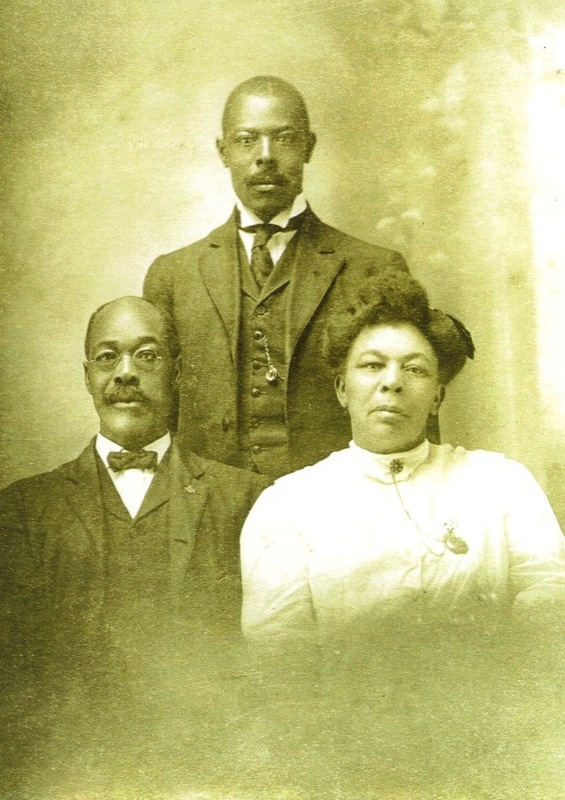 Their son, Ketchum Sloan 1881-1958 is standing behind his parents. When we arrived in Brenham last Monday, I visited the Washington County Courthouse and met with the Washington County District Clerk, Tammy Brauner. Ms. Brauner had already provided copies through the mail of 44 pages of the case file #7312 regarding R.S. 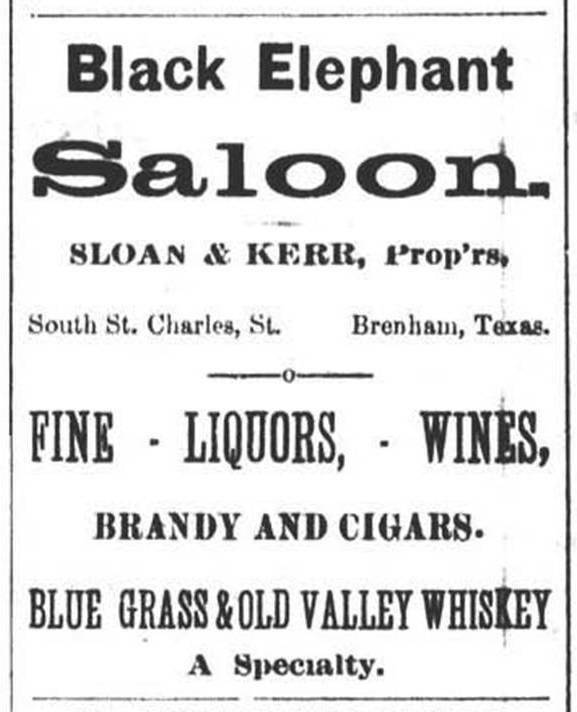 Sloan and wife vs. the Houston and Texas Central Railroad Company. When I told Ms. Brauner that I was headed to Brenham on October 3, she graciously offered to hold the case file in her office so I could examine the rest of the pages. I sincerely appreciate Ms. Brauner's assistance in obtaining the information from this court case. Robert S. Sloan and his wife Mattie sued for damages associated with the death of their son, Samuel R. Sloan subsequent to injuries he received in a train accident on September 24, 1893. The District Court Case included poignant testimony from Robert Sloan about his son, Sammy and offered a picturesque window into the lives of the Sloan family in 1893. To view the entire case file and some related documents use this link. My visit to Brenham also gave me the opportunity to visit with retired Judge Eddie Harrison. Judge Harrison is very active in historical preservation efforts in Brenham and throughout Texas related to Buffalo Soldiers, Camptown Cemetery and the Brenham Normal School. He told me that Bob Sloan had attended Brenham Normal School so I am looking forward to perusing those records. 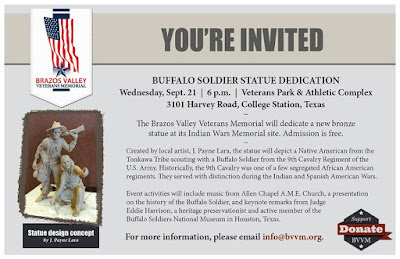 On September 21, 2016, Judge Harrison gave a keynote address at the dedication of a statue at Veterans Park, 3103 Harvey Road in College Station. 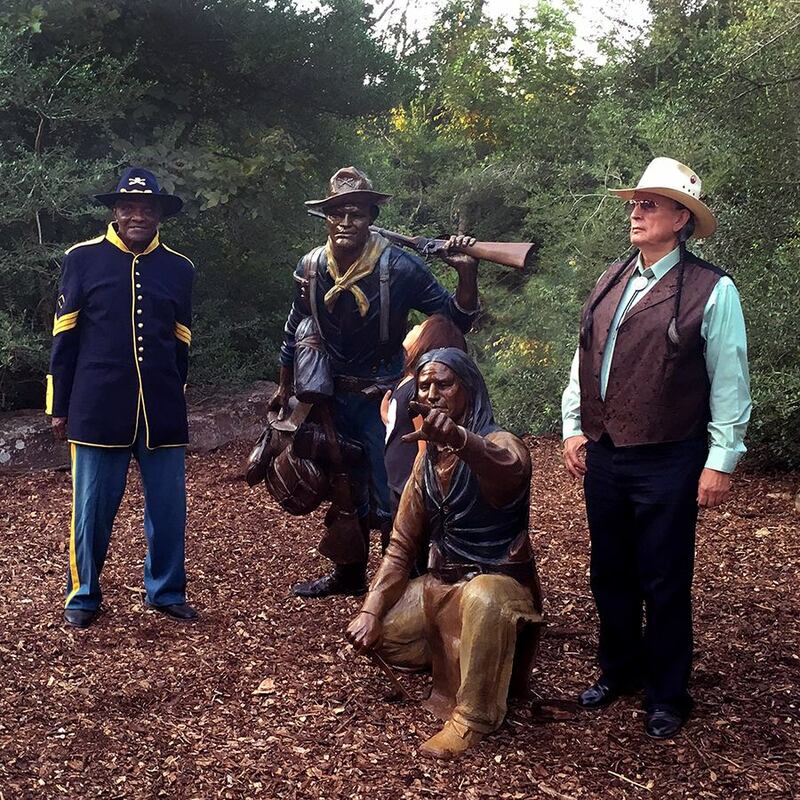 The statue depicts a Buffalo Soldier from the 9th Cavalry Regiment of the U.S. Army and a Native American scout from the Tonkawa Tribe. 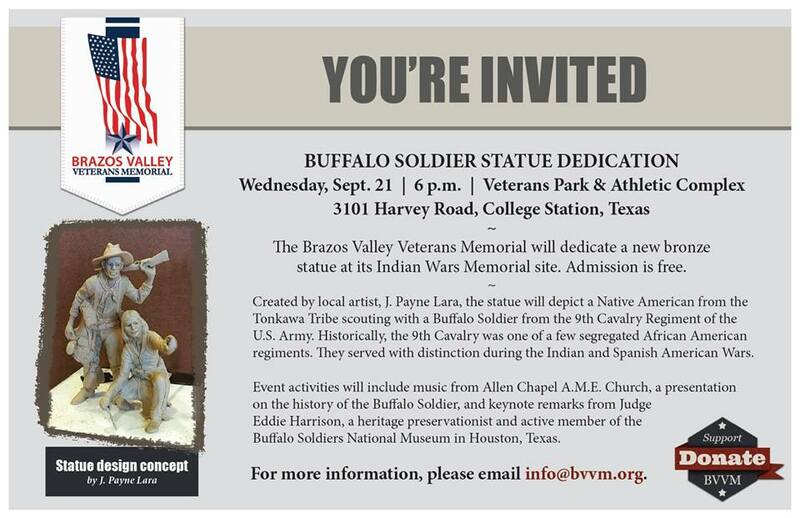 Judge Harrison was selected by the Brazos Valley Veterans Memorial Board as the model for the Buffalo Soldier. The 9th Cavalry was a segregated African American regiment that served with distinction and valor in combat during the Indian and Spanish American Wars. Judge Harrison is on the left and Don Patterson of the Tonkawa tribe is on the right. Artist J. Payne Lara used the likenesses of these two gentlemen to create the statue seen in the center. The curious little girl gazing at the Buffalo soldier is Mr. Patterson's grand niece. 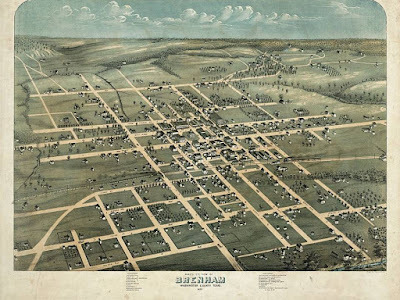 The other aspect of Brenham history that is quite intriguing is the number of German immigrants that settled in Brenham and Washington County. I had the pleasure of presenting to the Washington County Genealogical Society (WCGS) on Monday night, October 3, 2016 at Blinn College on the topic: "By Land and Sea- Tracing the Routes of Our Immigrant Ancestors." I was amazed that close to 90% of the attendees at WCGS had German ancestry. My thanks to Jan Kelm and Geraldine Johnson for inviting me to speak in Brenham. My name is Robert S. Sloan; I am married and my wife’s name is Mattie Sloan. I am plaintiff in this case. This is a suit brought by myself to recover damages for the death of my son, Sammie Sloan caused by injuries received by an accident on the Houston and Texas Central Railroad. 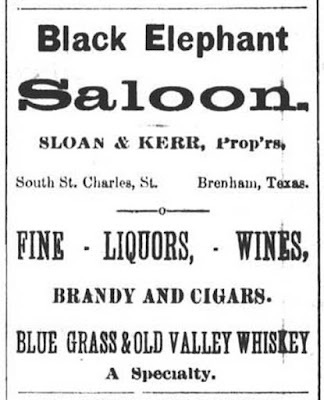 At the time of the death of Sammie he was eleven years and thirteen days old; the accident occurred on the 24th day of September 1893, it occurred in the City of Brenham on Market street, it runs south and north in front of Lockett’s livery s t a b l e and in the rear of the Levy Hotel and crosses the Houston and Texas Central Track; the crossing where the accident occurred is east of the freight depot, it is the first street east of the depot. It was about half past five o'clock when the accident occurred, between five and six o' clock in the evening. The boy was going from Mrs. Blooman’s to the jail to carry Mr. Blooman his supper; Blooman lived on Market street south of the crossing four or five hundred yards. The jail is located on Sandy street north of the railroad and Sam had to cross the railroad track to take Mr. Blooman his supper; this was between five and six o'clock when the accident occurred. I did not witness the accident myself, I heard of it ten or fifteen minutes after it happened, he had been carried to the saloon, he was carried from where he was hurt to my saloon. This leg, the left leg, was split down to the ankle, from the knee to the ankle and the calf of the right leg was smashed, fractured. It was ten or fifteen minutes after the accident that I saw him. His left knee was knocked out of place. Sam was the ordinary size for a boy of eleven years of age, he was well developed and good size, he was healthy and in good condition. I suppose he was about four feet tall and would weigh about sixty-five or seventy pounds; he was healthy and robust. He was in the habit of working after school hours, he was well acquainted with the white ladies and gentlemen and would go on errands for them; he would earn from four to five dollars per month, he would make from one and a half to tow dollars per week by waiting on families, he would hitch up the buggy and wash up dishes in dining room, he would hire himself out frequently to do that work and always gave satisfaction and was in demand in that class of work, he was manerable [sic] and smart and confidential; at one time he helped his mother at the church, would sweep out and open up the church; she was sexton at that time. At the time of the accident Mrs. Blooman was paying $1.50 per week to carry meals morning and night. After he was through with his work he was at liberty to go where he pleased. He was not an idle thriftless kind of a boy. He always wanted to work and save his money. He was an obedient child to myself and wife and was very attentive about home. He would carry the clothes for his mother and bring back the money. He would make fires and assist my wife. My wife took in washing. He would bring the clothes, carry back the money, make fires and empty tubs for her. He would assist me. He would feed the stock and attend to them. I had been paying a man $10.00 per month to look after my animal and he took him and he improved under his treatment. I know that his death was caused from injuries received on the 24th day of September 1893. After being injured, he lived until the next Sunday morning about two o’clock. It was on a Sunday evening that he was hurt and he died the next Saturday night or Sunday morning about two o’clock. He died from the injuries received. Outside of assisting me and my wife, he would earn on an average about $5.00 per month, taking into consideration the work that he did for my wife and me and others, I should think his services were worth at least fifteen or twenty dollars per month. I paid a man $10.00 for the work he did for me and he attended to the work after turning the man off. The accident occurred at the crossing at Market Street, east of the Central depot. That is a public street and generally used by the public and is within the corporate limits. It is about four blocks from the Court-house square. I hope to be back to Brenham soon to find more of the forgotten stories and make more friends! Sam Sloan's funeral was conducted by Elder Carmichael of the A.M.E. church. This may be the same church where Mattie Sloan worked as sexton. Excellentresearch and discoveries Nick! I must say that the Washington County Clerk's Office are a very friendly and helpful group. I always enjoy my research time there!